The Genomic Sciences Laboratory (GSL) is an active contributor to collaborative studies of diabetes, atherosclerosis and infectious disease genetics at the University of Virginia. The GSL resides within the Center for Public Health Genomics (CPHG) and serves as a technology and instrumentation core for the resident faculty and staff in the CPHG and their collaborators providing access to high throughput genotyping, nextgen sequencing and high volume liquid sample handling. 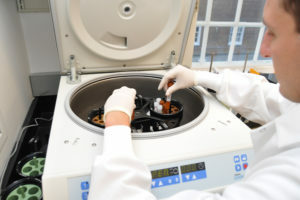 The GSL laboratory is located in a suite of interconnected laboratories outfitted with standard equipment for molecular genetics research (e.g. pipettors, centrifuges, scales, vortexes, chemical fume hoods etc.). There are multiple freezers and refrigerators providing ample sample storage space at -70o, -20o and 4o including a dedicated 4o cold room. Biosafety cabinets are available for the manipulation of human biospecimens, as necessary. Together, the knowledge base within the GSL as well as the technical capabilities and instrumentation serve as major resources for the CPHG. For more information regarding CPHG resources, please see these descriptions of the major equipment within the GSL.